In September 2014 we launched a campaign to highlight the courage of hundreds of Egyptian political prisoners on hunger strike in protest at abuse and injustice. 1000 hours of hunger asked activists outside Egypt to take part in a symbolic series of 24 hour solidarity hunger strikes. Over the following two months 44 people in six countries took part in the solidarity hunger strikes, clocking up over 1000 hours hunger in total. You can read their names and why they did it, online here. Students from 11 universities helped to build the campaign with leafleting sessions, ‘empty plates’ protests and speaking at meetings and events. In London we finished up with a protest at Cleopatra’s Needle on the Embankment, symbolically gagging the Sphinx to mark attempts to silence dissent in Egypt. Today we are asking for your support again for our campaign to mark the anniversary of the 18 day uprising which toppled Mubarak in 2011. Throughout the 18 Days we’ll be highlighting the story of the uprising itself, and the tremendous sacrifices made by people who braved tear gas and bullets to bring down a tyrant, as well as the urgent need for solidarity action today as activists face death, abuse and jail at the hands of Sisi’s counter-revolutionary regime. 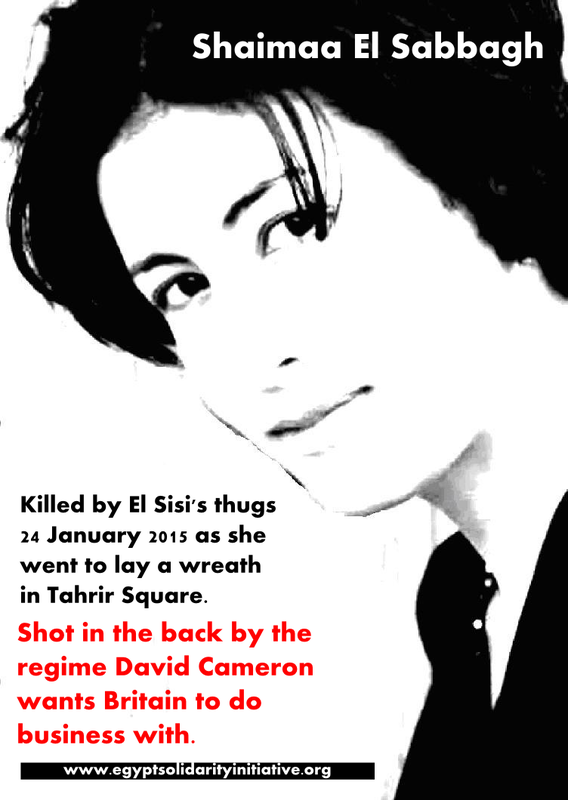 The murder of activist Shaimaa El Sabbagh by thugs from the Interior Ministry as she laid a wreath of flowers in Tahrir yesterday shows that the battle is far from over. We’ll be circulating materials to hand out at your college or workplace, model resolutions and posters to print and share online. We’ll be finishing up with a conference on 13-14 February to discuss the impact of the 2011 Arab revolutions across the Middle East with speakers from Bahrain, Morocco, Egypt and Syria. Read more and book up here online. 26 January – Mohamed Soltan marks the anniversary of his hunger strike – online action, details here. 27 January – Ahmed Maher, Mohamed Adel and Ahmed Douma from 6th April Youth Movement on trial for breaking the notorious anti-protest law. Solidarity page here (Arabic). 1 February – Mohamed Soltan’s trial resumes. 5 February – Shura council detainees on trial, including Alaa Abdel Fattah, now over eighty days into a hunger strike. Solidarity page here (Arabic and English). 9 February – Mahienour el-Masry on trial in a case from 2012, where she and other activists are accused of storming a police station. Solidarity page here (Arabic and English).